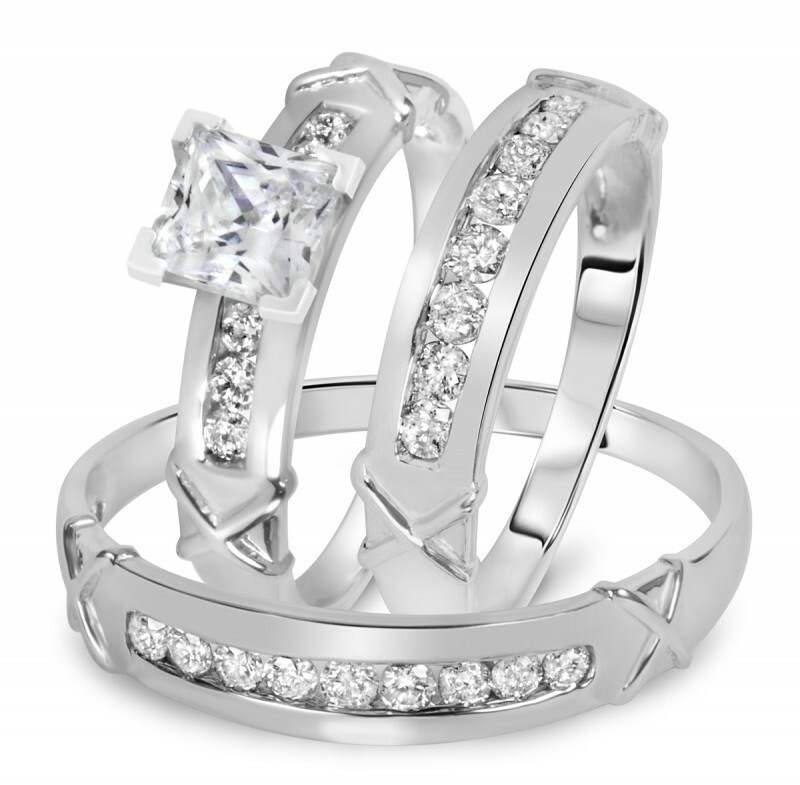 Modern style rings feature sharp lines, bold architectural elements, and tend to be more geometric. 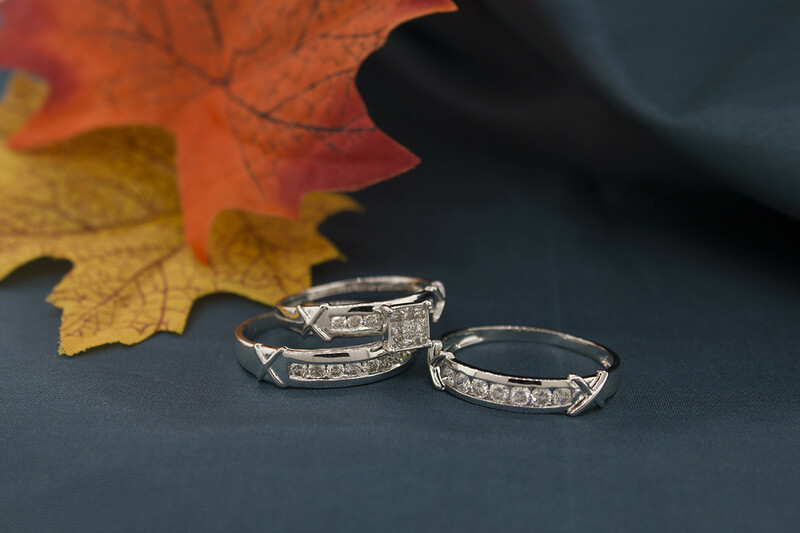 You'll love the contrasting shapes on this distinctive three ring matching ring set. 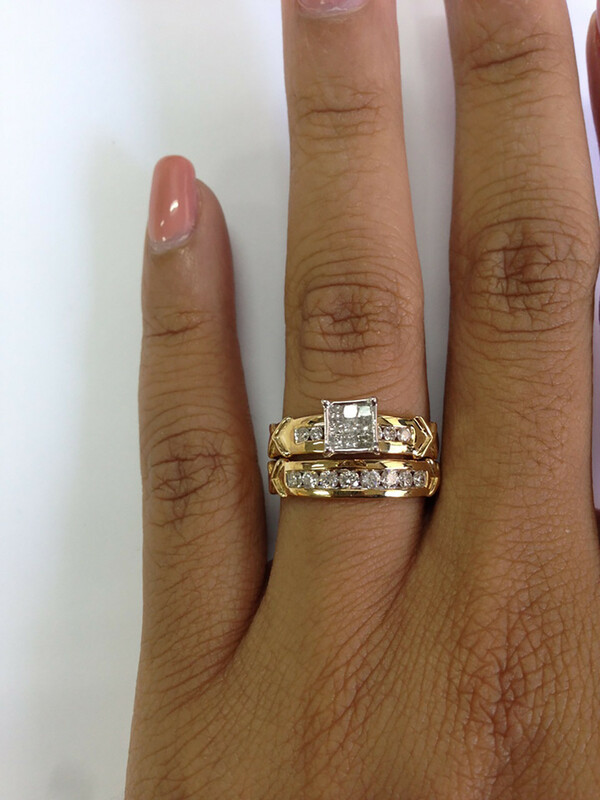 It features X shapes in 14K gold that mark the ends of each row of O's in the form of Princess and Round Cut diamonds. 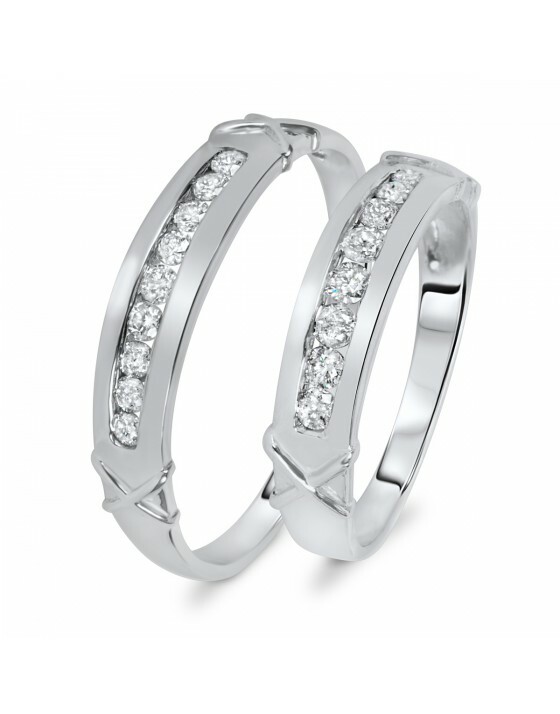 These shapes adorn the shiny 14K White gold band of each ring in the collection. 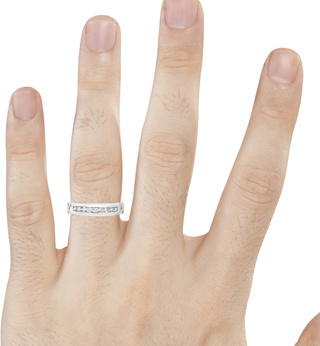 This playful ring set is perfect for people with a unique and unwavering sense of style. 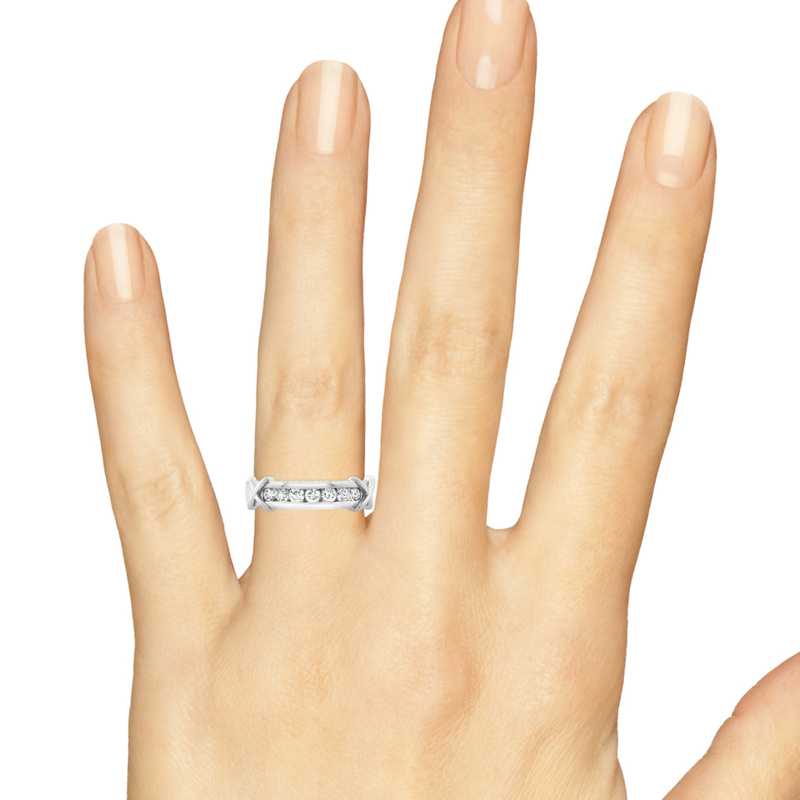 Exquisitely detailed X's and O's mark this Engagement Ring with a beautiful Princess Solitaire elevated above the band. 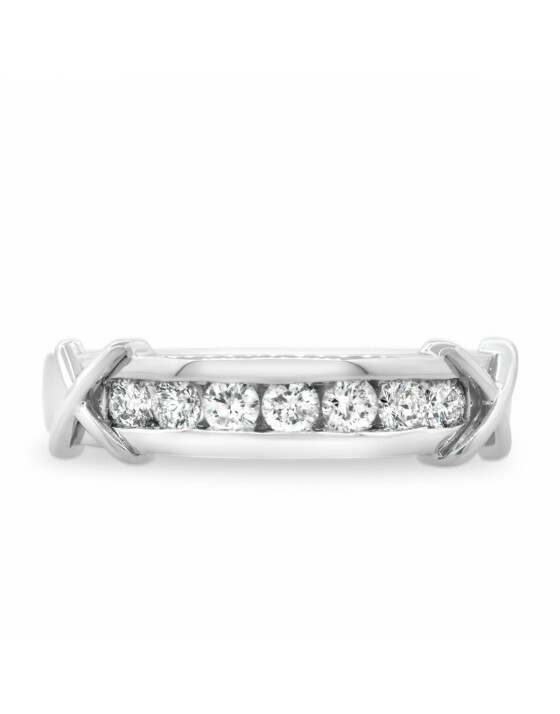 With a total of 7 Princess and Round cut diamonds, in parallel to the radiant 14K White gold band is perfect for women who love to show off a unique style in an understated way. 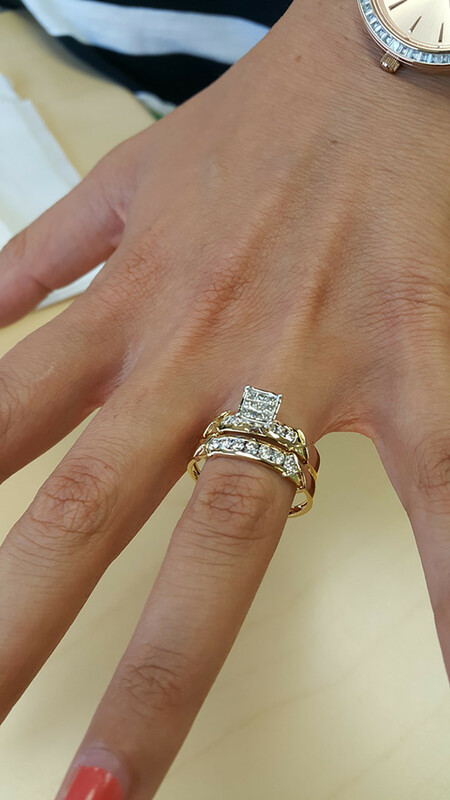 To complement your exquisite engagement ring of this one-of-a-kind set, you have a beautiful Ladies Band. 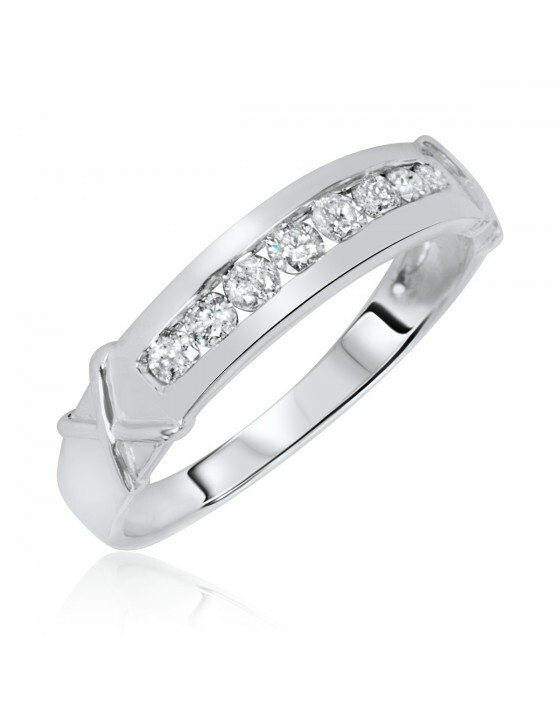 This ring matches the engagement ring with its own luxurious style and without overshadowing it and has a matching bed of 8 round cut authentic diamonds and X designs in its stunning 14K White Gold band. 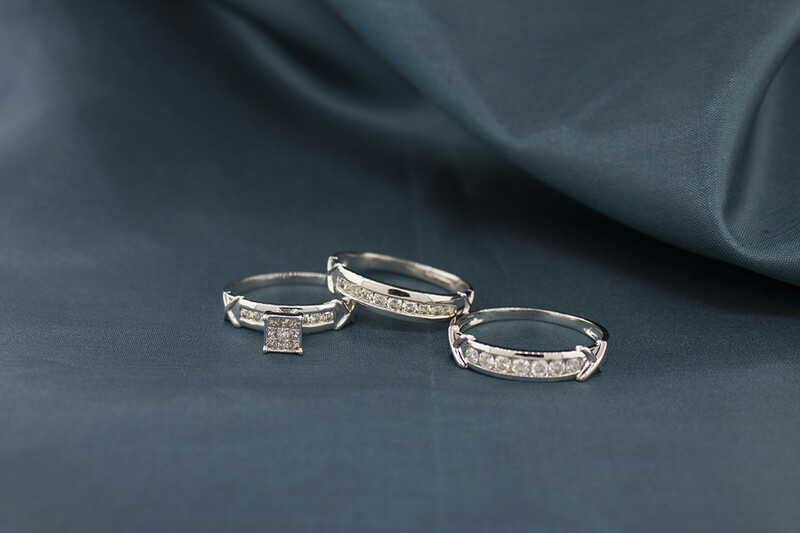 You won’t have to sacrifice your machismo when you order this handsome men's Band in this brilliant trio wedding ring set. 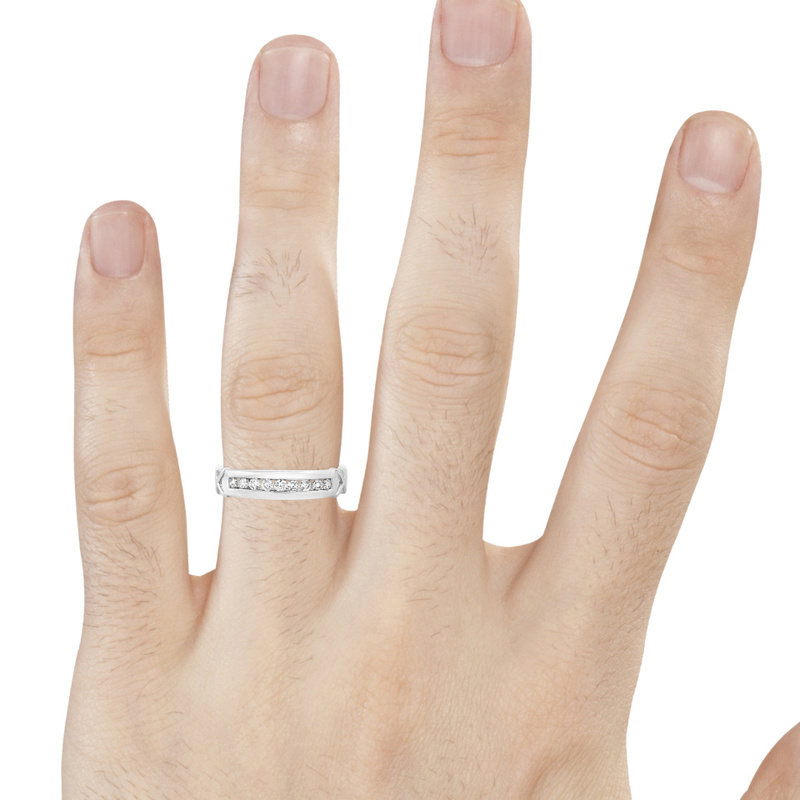 This men's Band resembles muscularity with a 4.86 mm ring width and X designs that evoke a sense of strength. 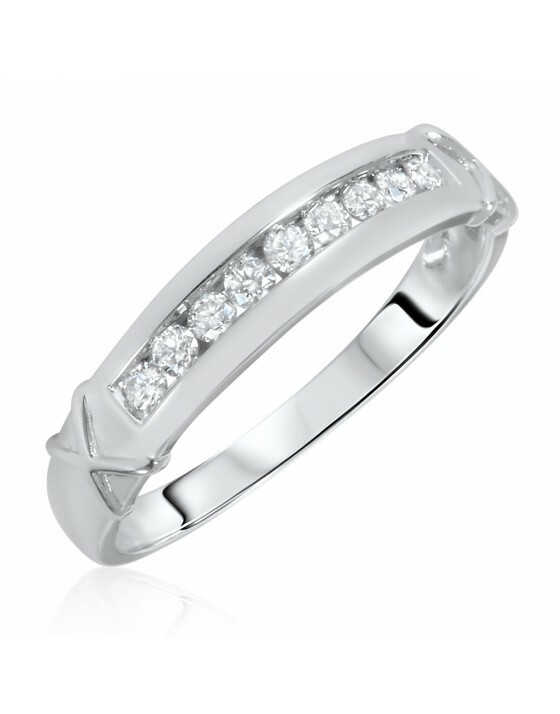 You’ll love the touch of sparkle with a subtle row of 9 round cut diamonds imbedded within the crafted 14K White Gold band. My husband lost his original ring. We recently replaced it from you guys. We are so happy to have a matching set again. 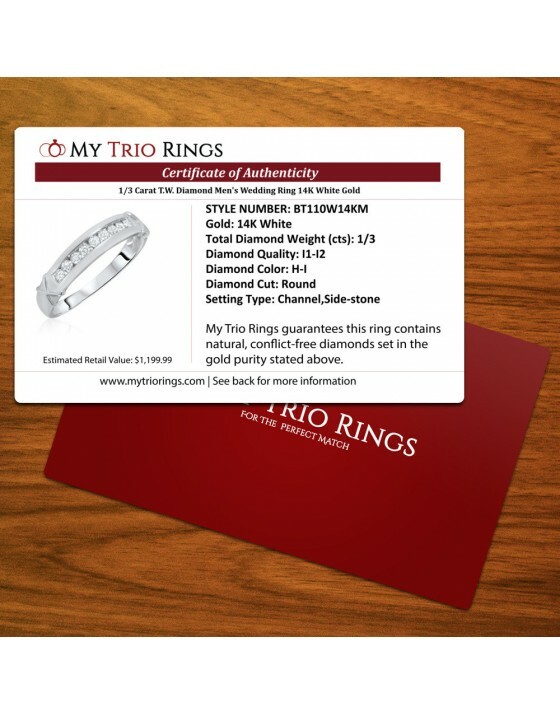 Thank you My Trio Rings! Delivery was fast. 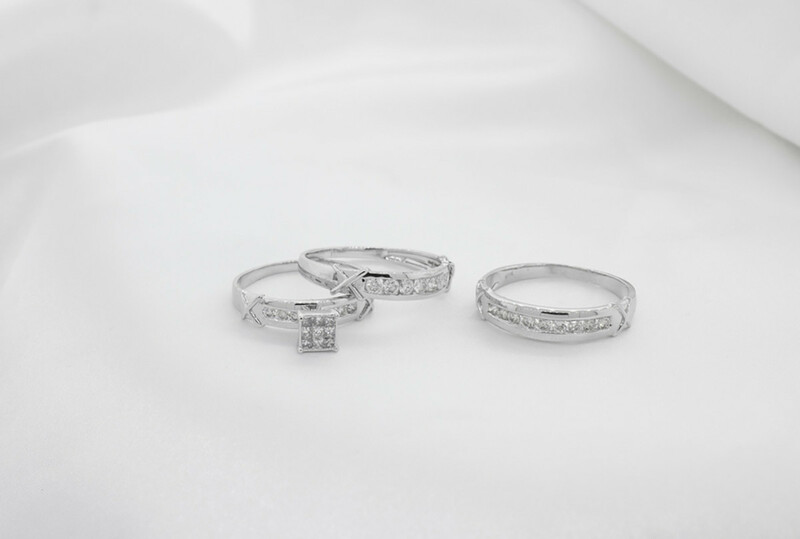 We love our rings!!! 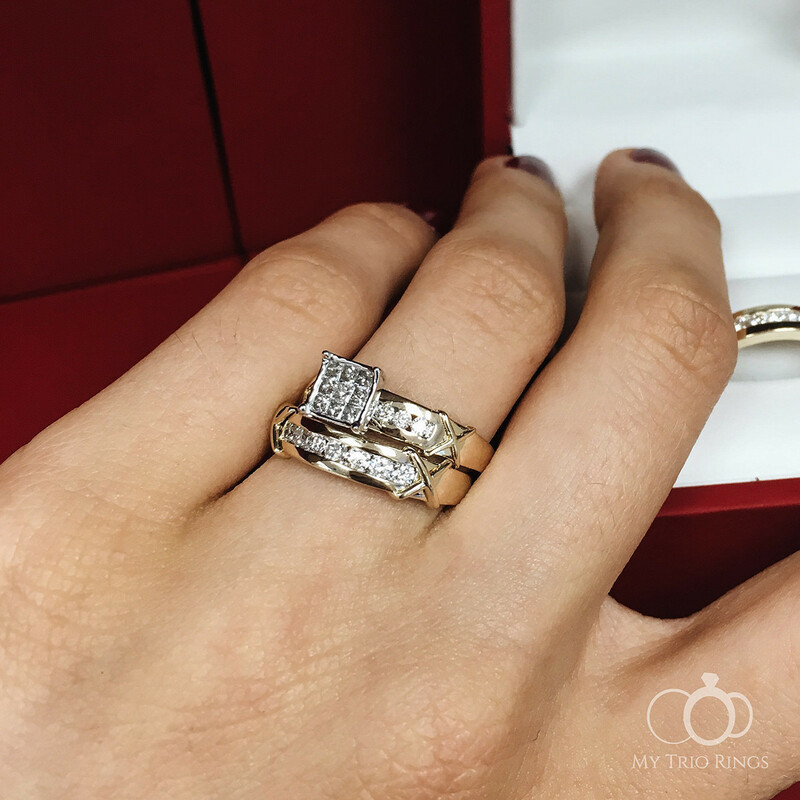 Like most people, we were a little hesitant to purchase anything valued over 1k from the Internet, let alone diamond rings! Fortunately, it was a very smooth process. Customer service was very prompt with payment verification and the rings were shipped exactly as stated. 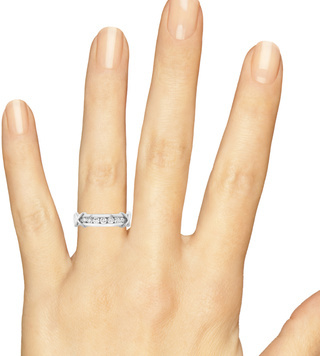 The engagement ring is very simple and VERY stunning! I receive daily compliments from co workers and patients alike. 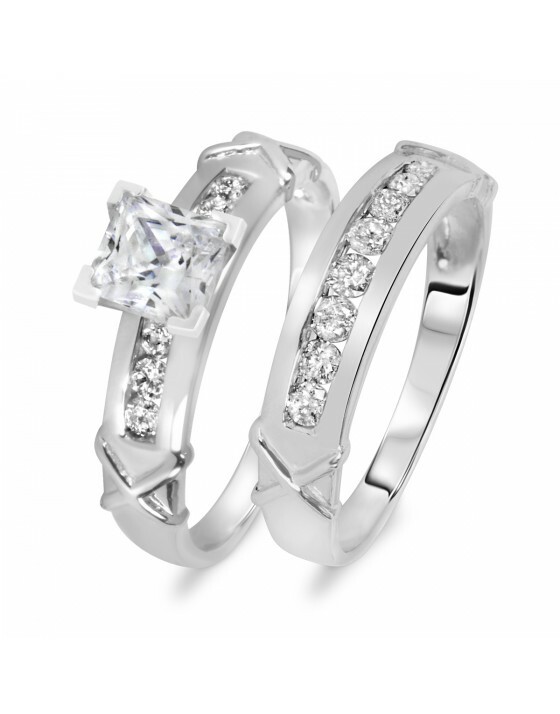 I appreciate MyTrioRings because I was able to find a ring for my fiancé and I for 1 price that was affordable for me. 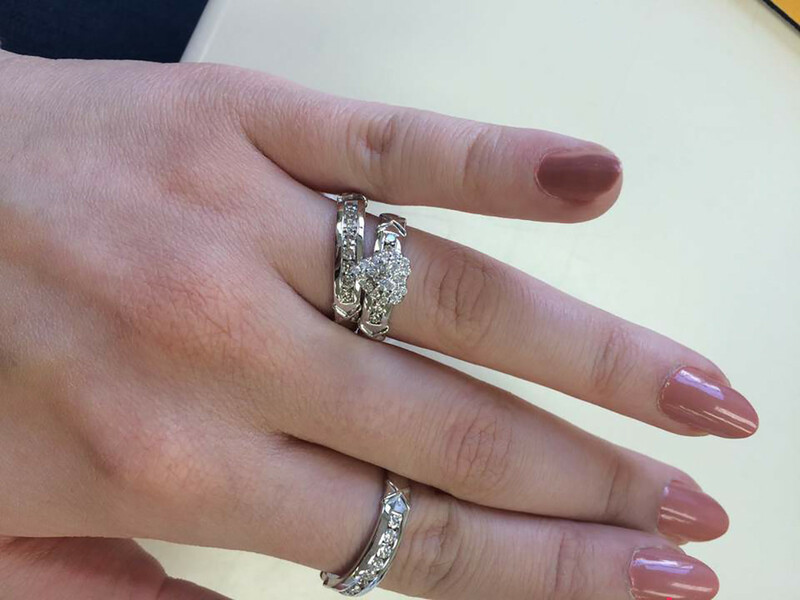 Ring shopping 1 month before my wedding and work schedule conflicts was becoming very stressful - It was nice to make such a purchase without any pressure from a sales staff. Thank you MyTrioRings! Looking forward to our next purchase!